The Paynesville Area Chamber of Commerce gave out awards to community members and elected board members at its annual banquet last week. The Paynesville Area Chamber of Commerce gave its annual awards at its banquet last week. 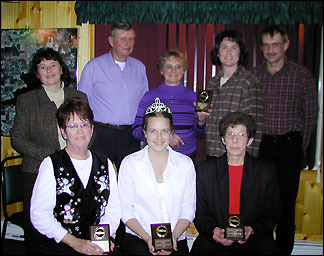 Members of the community honored were: (front) Tess Thielen, Employee of the Year; Morgan Martinson, Outstanding Young Person; Joyce Spaulding, Community Service Award; (back) Bev Mueller, Boss of the Year; Steve and Claudette Nietfeld and Ray and Rita Nietfeld, Farmers of the Year. For 26 years, Bev Mueller has worked for the Paynesville Area Health Care System, where she is the acute care administrator. Mueller has 50 people working under her, and she has been described by some of them as "accommodating and helpful." One member of the PAHCS nursing staff said Mueller is very easy to approach and doesn't have any hangups about getting feedback from her staff. Mueller said her supervisory style is to do her job well and treat everybody fairly. "We all work together and I have respect for everybody I work with," she said. Mueller is a past president of the Paynesville Area Chamber of Commerce and she still works on Chamber projects. Most recently she worked on the queen pageant and the Town and Country Days parade. Tess Thielen is the office manager at Voss Plumbing, Heating, and Air Conditioning, where she has worked for 25 years. Nominated by one of her supervisors, her nomination form said she has an infectious smile and a genuinely warm reception for everyone who walks into the showroom. Since she started working at Voss, not only has she mastered working on a computer, she has also learned how to run a backhoe, how to solder copper pipe, and how to cut and thread steel pipe when a customer needed it. She's a member of the Paynesville Cemetery Board and plays Mrs. Claus at Christmas for the Eden Valley American Legion Auxiliary, where she is the club president. This year, the Farmer of the Year award went to a family that has opted to work together. Ray and Rita Nietfeld, along with their son and daughter-in-law Steve and Claudette, operate a dairy farm west of Lake Henry, where they raise corn, oats, alfalfa, steers, and hogs. The Nietfelds also raise some animals that aren't typical to central Minnesota farms: pheasants, wild turkeys, and geese. Ray also raises parakeets and finches for his own pleasure. The group believes farming is a lot of hard work and there isn't enough time in a day for all of the work necessary to run a farm. The Community Service Award went to Joyce Spaulding this year. She is an active volunteer at the Paynesville Area Center where she delivers meals on wheels and is a member of the board of the R.O.S.E. Center. She works with others at the center recycling greeting cards and is a member of the Centrist Choir. Spaulding is also one of two women responsible for setting up a scholarship fund in memory of Paynesville students who died before graduation. Morgan Martinson, daughter of Luke and Laura Martinson, was named Young Person of the Year. Martinson is the reigning Miss Paynesville and holds a summer job at the Paynesville Dairy Queen. The 18-year-old senior at PAHS is a member of the band and choir and has competed at the state level as a soloist. She is on the volleyball team, the track team, and is a member of God's All Star Puppeteers at Nordland Lutheran Church, where she and her family are active members. 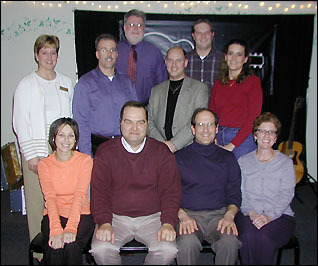 Paynesville Area Chamber of Commerce board members for 2003 are: (front) youth representative, Heather Fuchs; president, Jeff Bertram of West Central Sanitation; Wayne Walther; secretary, Kay Spooner; (center) Stephanie Malingen; Dave Currens of Community First National Bank; past-president, Chris Stanley; vice-president, Ann Johnson of the Paynesville Press; (back) Bill Spooner; Lance Louis. Not pictured are Todd Burlingame and Paul Evans.